ROBERTSON (nee McGrenaghan) Nuala (Dundee, Scotland), loving wife of Ritchie and devoted mother of Ciara and Kevin, daughter of the late Fran and Anne McGrenaghan (Fintona) and sister of Sheelagh, Michael, Aidan and Maeve. Prayers at St Lawrence's Church, Fintona on Saturday March 19, 2016 at 2.00pm. Followed by interment in adjoining cemetery. 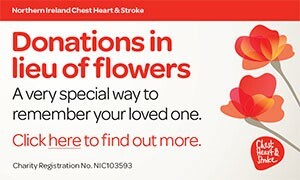 Family flowers only please, with donations in lieu of flowers if desired to Breast Care Cancer, c/o Fitzsimons Funeral Directors, Creevy House, 51 Saintfield Road, Crossgar, BT30 9HY. I am sorry to tell you that Nuala ROBERTSON has passed away.